Listening to English songs is common. You can easily hum the song, learn the lyrics, learn the tune and it is easy for you to sing it loud. But there are few people who are willing to learn other international languages than English only. One such language is Russian. Talking about Russian, there are many Russian songs that are not only treat to ears but also immensely popular. If you don’t understand the language and are in deep thought how to listen to the song then it is easy. Get the videos of the songs where the lyrics are available and watch and listen to the song over and over again. It won’t get much time to learn the song. 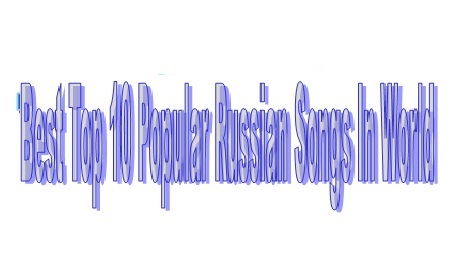 When it comes to Russian songs there are many foot-tapping songs that are perfect for parties and clubs. There are also a number of soft-romantic songs that will make you melt at heart. The wartime song, Katyusha is all about a girl who is waiting for her love. Her love has gone to war and she is missing their ‘we’ time. The song depicted a comparison between the past and the present of the couple. It was a sad song and folk based. This song was made several times after its original release in other languages. Provance/Provence is a song that made a huge hit in the Russian music industry. Not only in Russia but the song had managed to grab attention from rest of world too. It has romance, dance and lot of foot-tapping song that anyone can go gaga over it. It is a Russian folk song. The song depicts the death of a soldier during war. It was a sad and mournful song. The word Black is used in the Black Raven version to show the loss of many lives during wartime especially the soldiers who lose their lives to save the country. The song by Loboda, your eyes is another popular song that will make you go dance. The ravishing singer was featured in the music video. The song was based on a girl who found out a man from different planet. How the girl and the man fall in love is the main concept of the song. I will not give you up is a song based on a passionate and possessive lover. The song has become a huge hit from the girl band namely Serebro. This song is from one of their hit and popular albums. Kit-i (Kitay) is one of a kind Russian singer. The song My heart has two version one is in Russian and the other one is in English. The song is slow and has many emotions in it. It had received major positive appraisal from the music fraternity across the globe. Another huge hit from the lady singer Loboda, Tvoi Glaza is a song from her album your eyes. The music and the tune were loved by all the critics and music lovers. Tvoi Glaza is a romantic song with some foot-tapping music. The music video of the song was also made a good place in world music charts. This song is produced and composed by the famous Russian band Gradusy. The song was written when the lead singer was in great loss. He wanted to show that to the world through his song. So he wrote the song in negative way. But after some time he rewrote the song again with more positive notes. The lyrics were based on how to overcome loss and how one can fight back the hard time to get his good time back. Loneliness is a sad song that depicts how a person feels lonely and craves for a relationship. There is a day to day work, friends and family and all but still everyone needs a companion and a relationship that makes you happy. This song is all about that feeling of loneliness. This is one of the biggest hits of the Russian girl band in US. Not only the States but also the song got huge positive response across the rest of the world. The music video of the song created much buzz as the video has a scene of two girl band members kissing each other.